Waterway NEO 1500 spa control with NEO 1100 Topside. 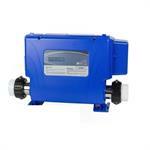 Use NEO 1500 Control for 1-2 Speed Pump1, 1-1 Speed Pump 2 or Air Blower, 4.0 kW Heater, w/NEO 1100 7-button topside. Wi-Fi and Bluetooth option. This spa control is 240V and can be converted to 120V.